Tartan Ribbon The Black Watch Tartan Ribbon was originally, and remains more correctly called "The Government Tartan", featuring the famous dark blue and green undercheck, on which most military tartans are based. 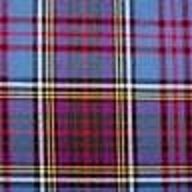 It is also under the auspice of both Clan Campbell and Clan Gordon. A Black Watch Wired Edge tartan ribbon with silver and gold edges is also available but this ribbon is now extremely rare and stocks diminish quickly. *please note pricing varies with width size.